Moscow is hosting the 17th meeting of the-Russia Intergovernmental Commission on Economic Cooperation today. The commission is co-chaired by Russian Economic Development Minister Maxim Oreshkin and Azerbaijani Economy Minister Shahin Mustafayev. The two sides are discussing prospects for developing trade and economic relations, including in the field of agriculture, industry, transport, energy, construction and tourism. The Russian Economic Development Ministry earlier said that the key topics on the agenda will be the diversification of economies of the two countries, improvement of collaboration between business communities as well as realization of the decisions adopted by the Azerbaijani and Russian presidents on September 1, 2018, in Sochi. A number of documents will be signed at the meeting. 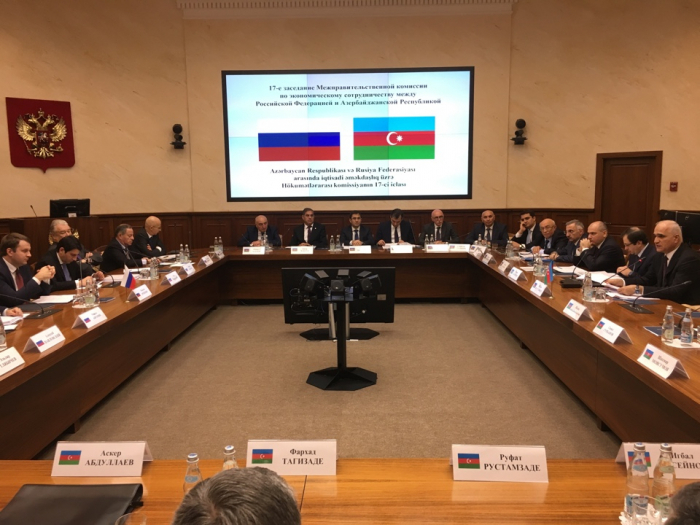 Maxim Oreshkin said that a thorough discussion on key areas of further economic cooperation between Russia and Azerbaijan took place during the closed meeting. "I would like to note that we had a very successful cooperation in 2018. There is a positive dynamic in the development of foreign economic relations in a number of key areas - trade, investment, and other areas of cooperation," the correspondent of Vestnik Kavkaza cited the minister as saying. "We had a fruitful conversation, there is a whole set of new directions which will be worked out with our colleagues in 2019. I think that if the plans outlined by us are implemented, the economic relations between Russia and Azerbaijan will come to a new level," Maxim Oreshkin added. Shahin Mustafayev, in turn, noted the success achieved in the economic sphere. "This year some important events took place in terms of the development of our economic relations. First of all, I want to note Azerbaijani President Ilham Aliyev's visit to Russia on September 1, his meeting with Russian President Vladimir Putin, when about 20 important documents were signed. Of these, I want to note the Cooperation Program until 2024. I believe that this document, which will include a number of roadmaps, will be a fundamental program document and will determine directions of bilateral economic cooperation in the coming years," he said. "We have a positive dynamics in all directions. Our statistics shows an increase in trade turnover both last year and 11 months of this year. In 2017, it increased by 34.4%. It is important that the dynamics are determined by both import and export, which means that our cooperation is mutually beneficial. Russia is still the main trading partner of Azerbaijan, it is number one non-oil exporter and importer," Shahin Mustafayev said, adding that an important dimension of the economic contacts between the two countries is regional cooperation. "Russia's investments in Azerbaijan exceed $4 billion, Azerbaijan’s investments in the Russian economy have exceed $1 billion. I think that in the future we will increase our efforts in this direction. I believe that our projects in petrochemistry, engineering, tourism and agriculture are successful. In addition, we see the potential in the field of pharmaceuticals and petroleum engineering, the production of agricultural machinery and automotive industry. One of the key areas is cooperation in the field of transport. Today we also discussed the strategy of the North-South International transport corridor. This project is not just viable, it is effective and has a great potential," the Minister of Economy of Azerbaijan noted. Azerbaijan's Deputy Minister of Education Firudin Gurbanov, speaking with the correspondent of Vestnik Kavkaza, said that education is an important area of ​​Russian-Azerbaijani cooperation. "I would like to note that Azerbaijan attaches great importance to the teaching of the Russian language, more than 3 thousand schools study Russian as a foreign language, and more than 300 schools teach in Russian. The Russian language Olympiad is held annually, this year it was the tenth one, and it was attended by a record number of students from more than 600 schools," he noted. "An association of Russian and Azerbaijani universities was created in 2015, many projects are carried out on this platform. The branches of two Russian universities - Lomonosov Moscow State University and Sechenov First Moscow State Medical University operate successfully. The establishment of other branches is discussed. In addition, there is cooperation between secondary schools, we recently agreed on the exchange of schoolchildren and the holding of joint sports and intellectual competitions between Moscow and Baku schools," Firudin Gurbanov said.